See pic - the numbers don't add up! 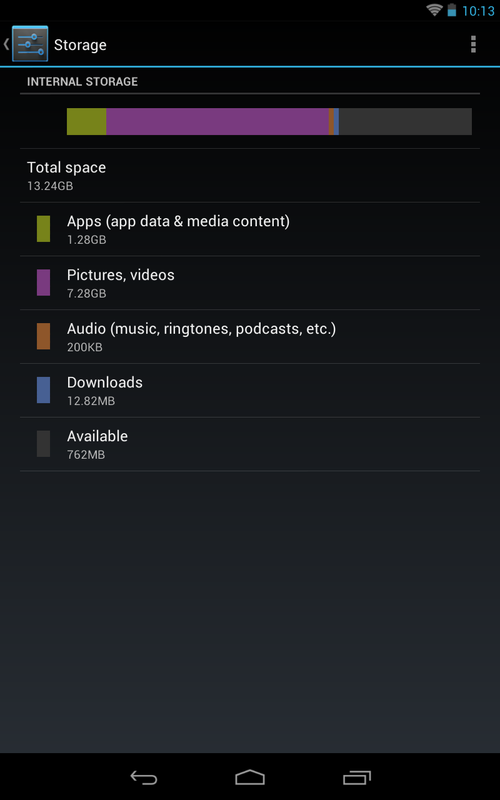 This is a 16GB Nexus 7 The listed items only add up to a little over 9GB. So 4GB worth of files are missing. How can I find those missing files? 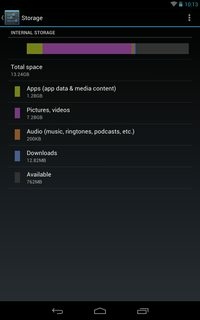 If the displayed detailed would be complete, you'd be correct: 1.28G + 7.28G + 200K + 282M + 762M = 9.6 GB total space -- while the summary says 13.24G. Explanation is easy: The details list is not complete. It e.g. misses Cache, temporary files, log files, tombstones, and probably some more. Where to find those? In the file system, and for completeness this requires root. For some more details, please take a look at corresponding questions by following the tags internal-memory and storage. A good source to start with is the question Something is secretly eating up my tablet memory and I need help finding it. Not the answer you're looking for? Browse other questions tagged nexus-7 storage or ask your own question. Which app can create a background image without distortions?